Editor's note: In our Behind the Scenes series, CNN correspondents share their experiences covering the news. 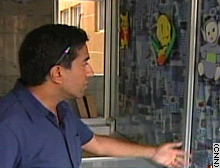 Dr. Sanjay Gupta looks at cut-outs on glass wall of nursery at bombed-out hospital in Beirut. BEIRUT, Lebanon (CNN) -- As I stood in a bombed-out nursery at Salel hospital in southern Beirut, I realized that this is the hardest part of my job. Certainly, it is difficult to travel to a war zone, go without sleep for days on end and worry about my own safety. And, of course, being away from my family is difficult, as well. Standing in that nursery, though, looking at the devastation of crumpled walls and shards of glass everywhere -- staring into the seven tiny, now-empty bassinets adorned with little cut-out figures of rabbits and turtles, now carelessly tossed on the floor -- is the most heart-wrenching of all. I came to Beirut to tell the stories of the victims of war and the heroes who save them. I found plenty of both. At Mount Lebanon Hospital, there is 36-year-old Zaged Melham, who was thrown 30 feet through the air, with shrapnel ripping through his hands, feet and abdomen. He told me he barely heard a noise, until the missile was nearly on top of him. Lahoud Lahoud, 27, is in more critical condition, lying in a coma after an early morning airstrike. What they have in common, though, is Dr. Nazih Gharios, one of the heroes of this war. A stately physician, Gharios kept Mount Lebanon Hospital open when every business around him shut down, worried about airstrikes in a neighborhood where Hezbollah dominates. "It is my duty," he told me, acknowledging that every day was a game of "Russian roulette." On the first day of attacks, he came up with a plan. With a bunker-like mentality, Gharios evacuated his patients to the subterranean floors of the hospital. In places that are normally used to store equipment and perform radiology studies, Gharios created a maternity ward, an intensive care unit and even a neonatal ICU, which is caring for a 600-gram (1.3-pound) newborn girl and two 1.2 kilogram (2.6-pound) twin boys. Patients here are blissfully ignorant of the whining of missiles above, some landing as close as 100 meters from the hospital. It is not to say that Gharios' plan is foolproof. Several of his staff members, including a surgeon who helped save Zaloud's life, have decided to leave, concerned for their families' safety. And Gharios doesn't believe he can hold out for more than a couple more weeks, with dwindling supplies and an increasing number of patients. As a doctor who works for CNN, I am often sent to the most troubled places on Earth. Whether it is the battlefields of Iraq, the shores of Sri Lanka or the mountains of Pakistan, I have seen extreme medicine practiced in almost impossible situations. Still, every circumstance is different. In Lebanon -- with the nearly continuous onslaught of airstrikes -- it does feel desperate, and very scary. And the hardest thing to take is seeing the devastation caused by a bomb falling so close to a nursery -- that makes me miss my own little girl that much more.